Many people don't like okra because of its slimy texture, but this mucilaginous quality is where okra's healing powers come from. Aloe, flax, slippery elm, and chia also have a mucilage factor, which means that they have the ability to heal the mucus membranes which line the inside of our bodies. Okra is also a rich source of fiber which has been found to have a beneficial effect on cholesterol, and it is food for your gut bacteria. 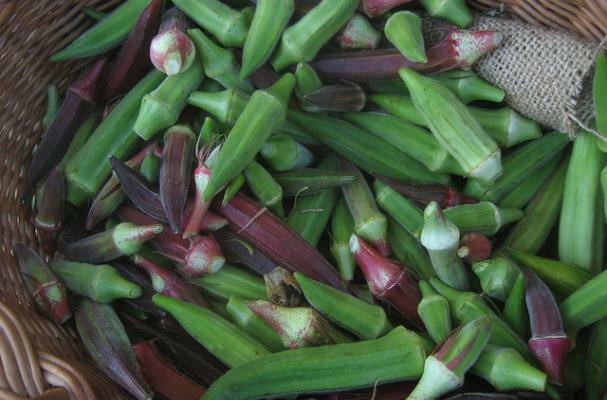 Beyond the health benefits, okra is also delicious when prepared properly. Enjoy these four recipes which will transform your opinion of this slimy yet beneficial seasonal fruit. Fill the okra with a blend of spices and onions for a delicious side dish. Throw in some beans or tempeh for a mouth-watering and nutrient dense meal. An ideal and tasty way to enjoy okra for those that can't handle the slime factor. Make it gluten free by using your favorite alternative flour blend. Not only is this dal loaded with flavor, but you won't even notice the okra's texture. It's nicely disguised within the dish. I like it plain steamed and dipped in your favorite sauce. When okra is not overcooked, it's not slimy. This is how I got my girls to eat it without being grossed out. I steam it for 5 mins and my favorite dipping sauce is soy and lemon. yummy!